I must admit that I didn’t have a real concrete plan for how I would accomplish these goals, but I thought I would figure it out along the way. I turned out to be half-right. I did see most of the things on my list, but I learned a few things along the way. Arrange to arrive in Yosemite during the daylight hours. On the last hour and a half of my drive into Yosemite, the sun had set, and I was driving along the sharp curves and steep cliffs in the pitch dark. It’s always disheartening when you know you’re driving through stunning scenery, but you can’t actually SEE it. I kind of messed up on this because of my last-minute detour through Death Valley National Park. I can’t say I regret that decision, because Death Valley turned out to an amazing detour. But it did put me behind schedule on my mammoth drive from Las Vegas to Yosemite. Try to make the drive from Las Vegas to Yosemite in a single day. I did it, and it worked out OK. 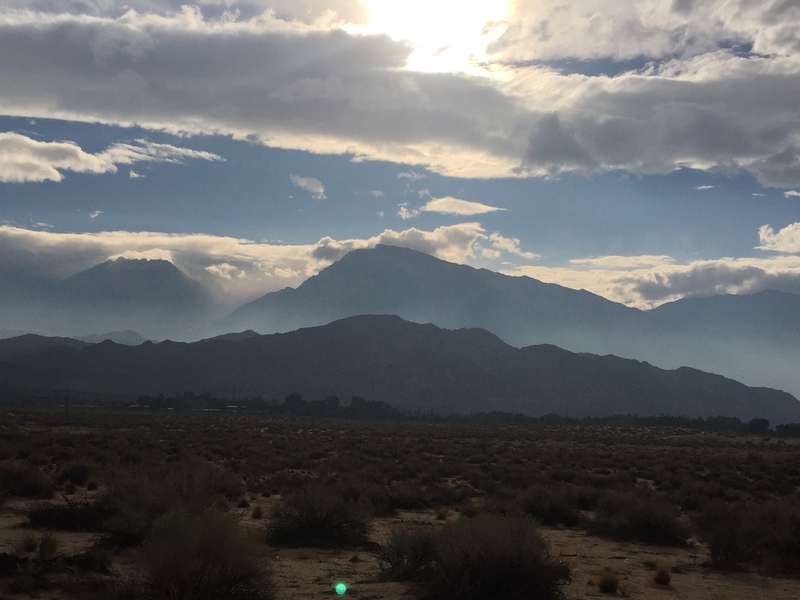 But by the time I got to Lone Pine, California in the mid-afternoon, I was really wishing I didn’t have a reservation for that night at Yosemite. 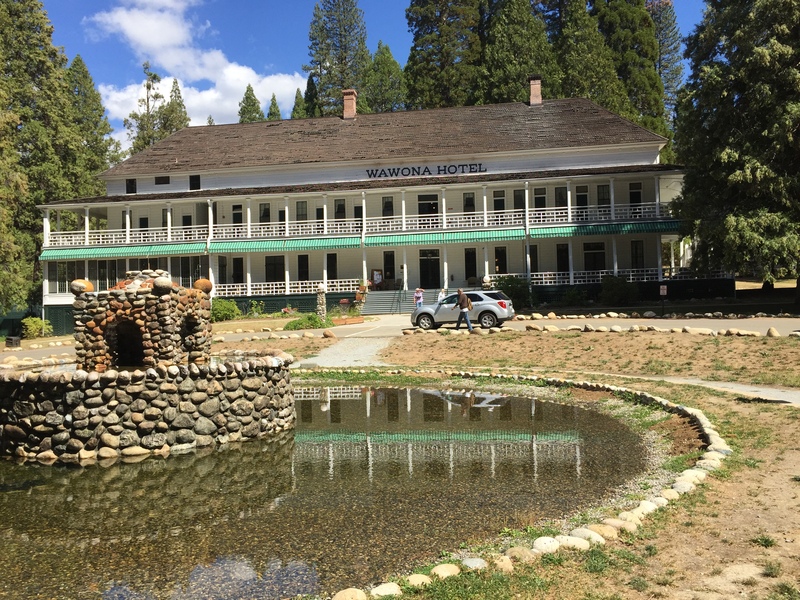 I would much rather have stayed in pretty little Lone Pine, where I could have soaked up the views of Mount Whitney, the tallest mountain in the contiguous U.S.
Take the drive over Tioga Pass, (elevation 9,900 feet) if possible. I know this route into Yosemite is closed during much of the winter and late spring, but if you’re traveling in the summer or early fall, I highly recommend the drive. It’s flat-out gorgeous, and I stopped a number (too many) of times for photos. 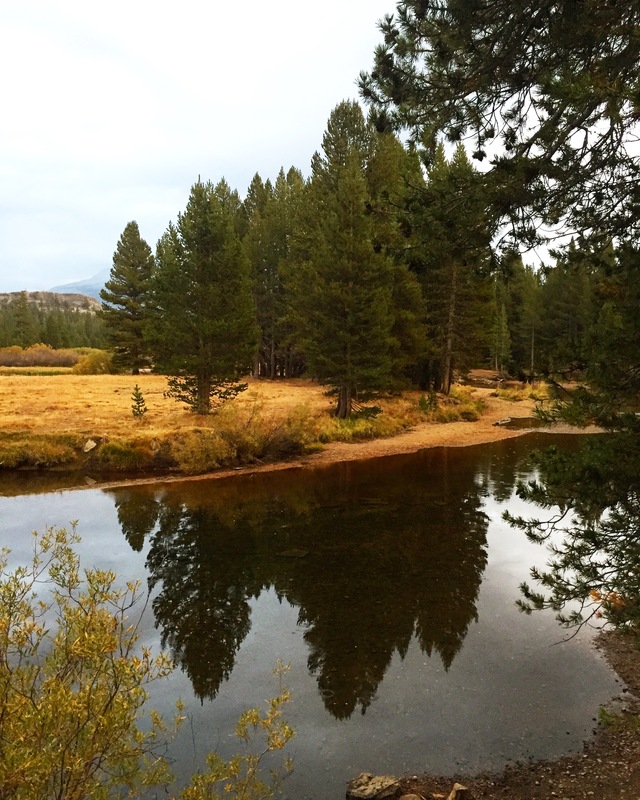 Rush through the Tuolumne Meadows area. The sun was just starting to set when I arrived at the gorgeous Tuolumne River. I stopped a couple of times to walk along the river and through the meadow, but I wished I had the time to really explore. Ask when you check in at your destination about the status of the various waterfalls. Specifically: Do they currently have water? I didn’t do this, but I heard a couple asking about it as I was checking out. 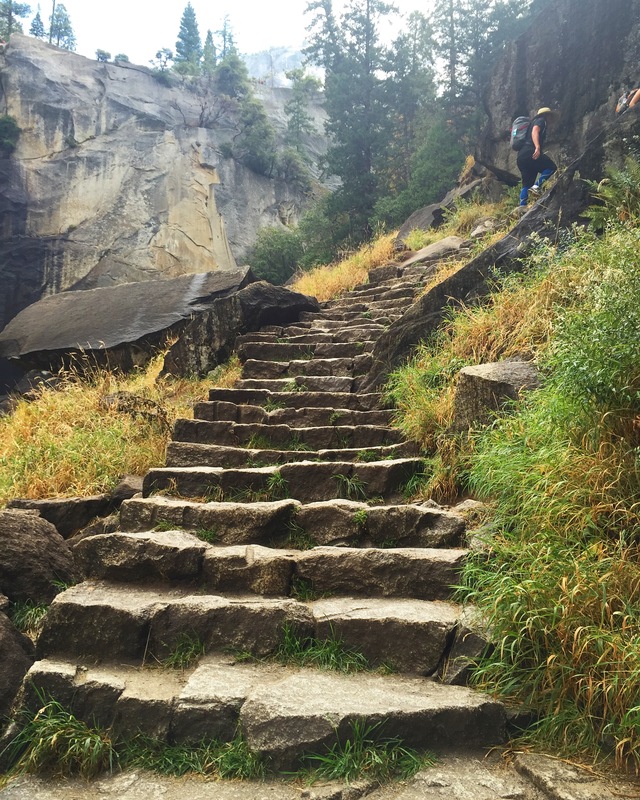 The reality is that most of the places I hiked to were dry, including Mirror Lake, Yosemite Falls, and Bridal Veil Fall, which had just a misty trickle. 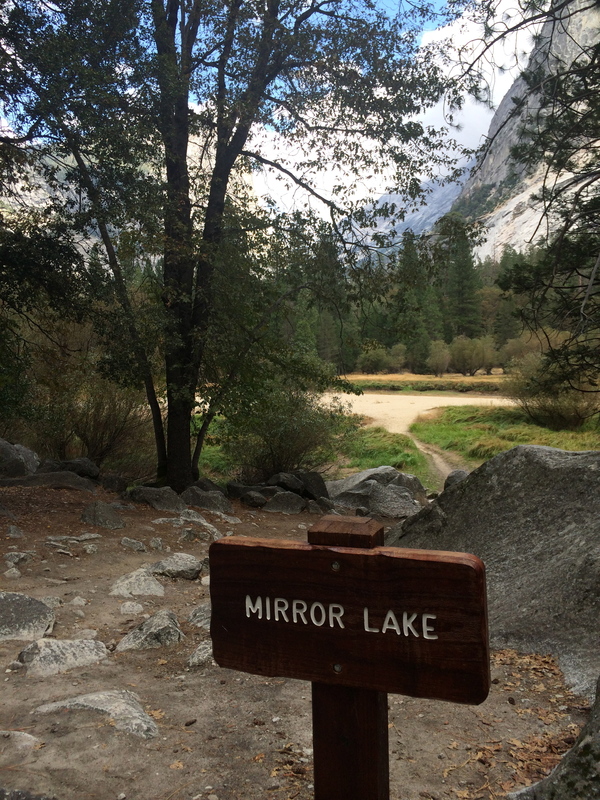 Not that I regret hiking to Mirror Lake. It’s currently more a meadow than a lake, but oh, what a meadow! You don’t get the reflections of Half Dome in the water, as I expected, but you still get some amazing views. 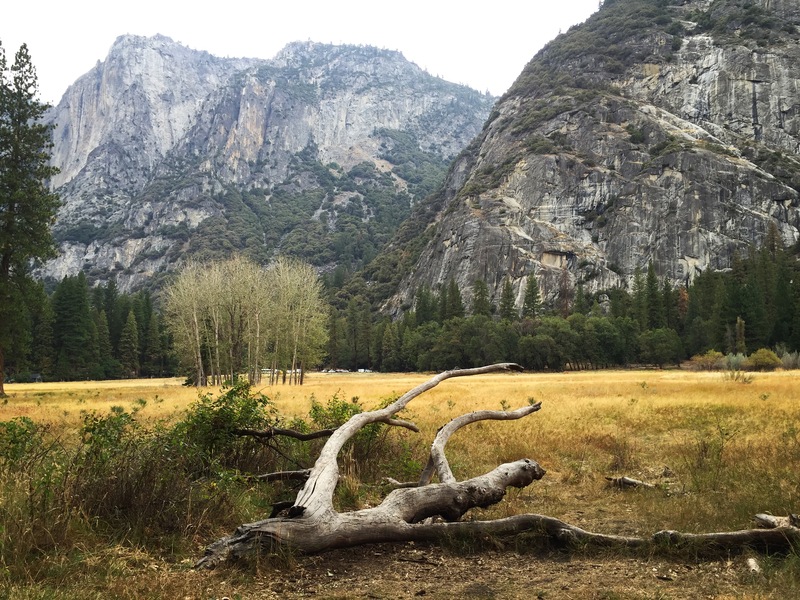 The Lower Yosemite Falls hike and the Bridal Veil Falls hikes are both short, so they don’t take up a lot of time. Had I known about the lack of water, though, I could easily have skipped both and not missed out on too much. Let a morning rainstorm deter you. 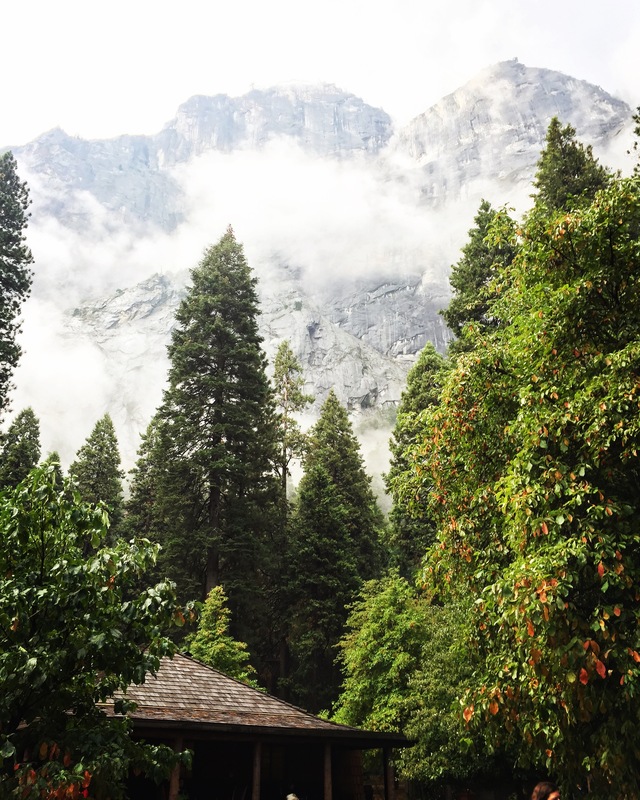 Through my first night at Curry Village, I heard rain falling on my tent cabin. I was a little worried about my prospects for hiking the next morning – especially when a light rain greeted me when I walked out the door in the morning. I decided to go ahead with my plans anyway, and boarded the Yosemite Village park shuttle. Rain was still falling when I got off the shuttle at the Vernal Falls stop, but I started up the trail (along with a dozen or so other hikers) anyway. Soon, the rain had stopped, and we were in for some wonderful views of the damp trail and of the lovely falls. Plan ahead if you want to do some of the major hikes. Vernal Falls (the Mist Trail) was a great hike, and I loved it. But if I hadn’t been wearing the right footwear or hadn’t taken enough water, it could have been miserable. It’s only about 1.2 miles to the top, but it’s fairly steep all the way. The final ascent is a series of 600 rock stairs, which presented a challenge – even for the most fit-looking hikers. 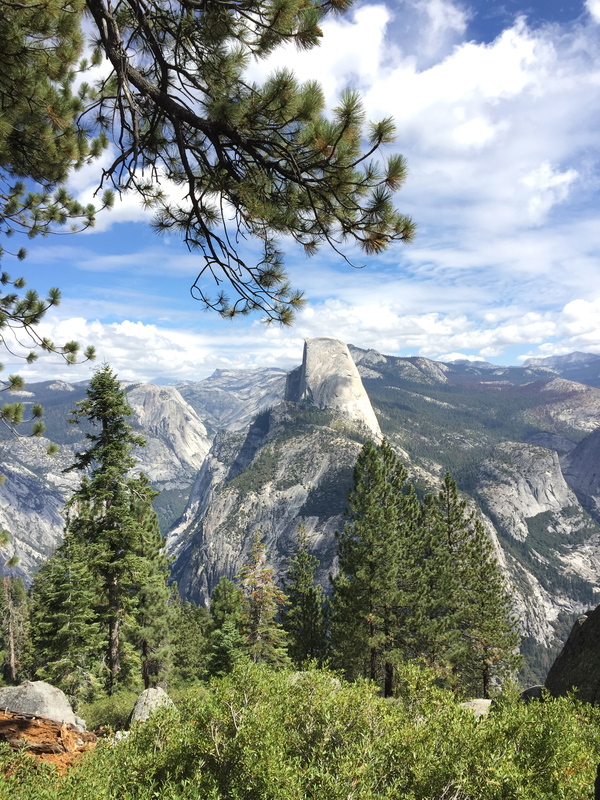 If I had had a little more time in Yosemite, I would have loved to keep going on the Mist Trail to Nevada Falls – another mile and a half up the trail. 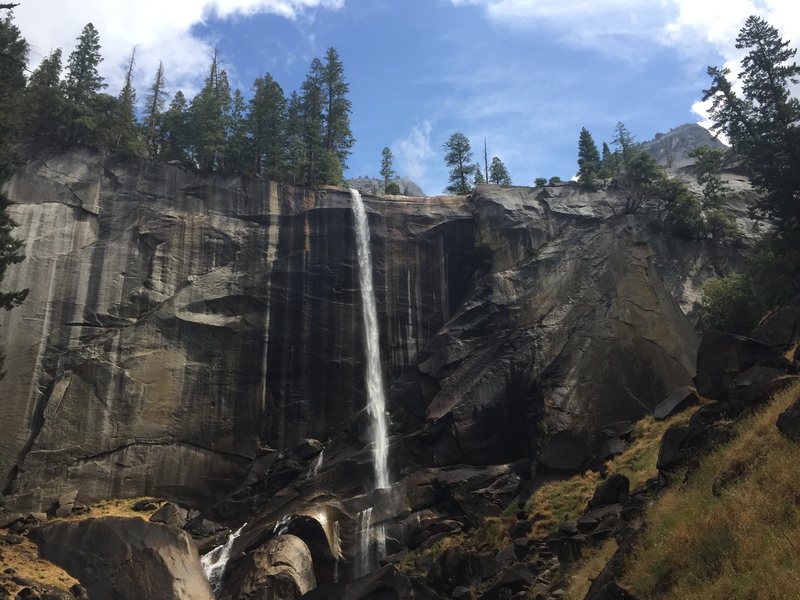 But it would have added several hours to my two-hour hike to Vernal Falls, and I decided there were other spots I wanted to see instead. Also, if you want to hike to the top of Yosemite Falls (which I didn’t do), expect a strenuous hike of 7.2 miles and 2,700 feet in elevation gain. Hiking Half Dome is even more extreme, and it requires a permit (only 300 per day). 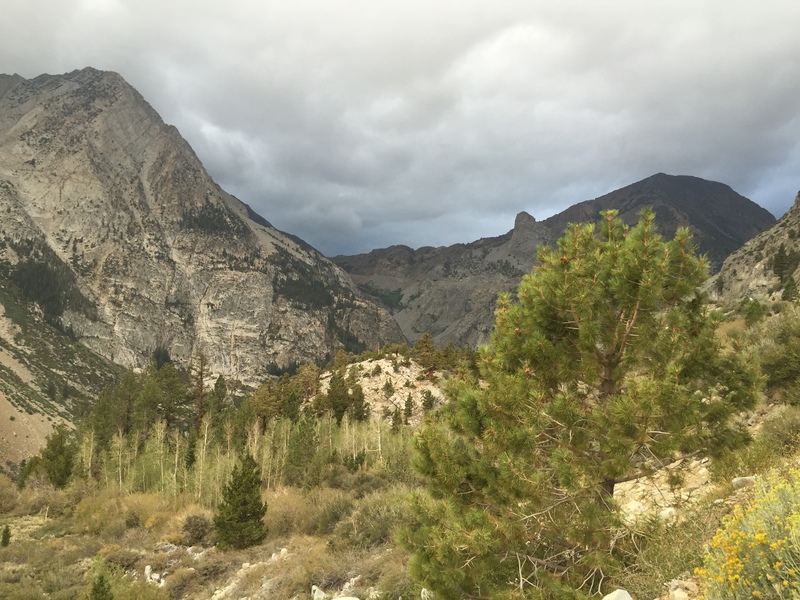 The hike is between 14 and 16 miles long, and involves a 4,800-foot elevation gain. Forget to take the drive south from Yosemite Village on Highway 41 on the western edge of the park. 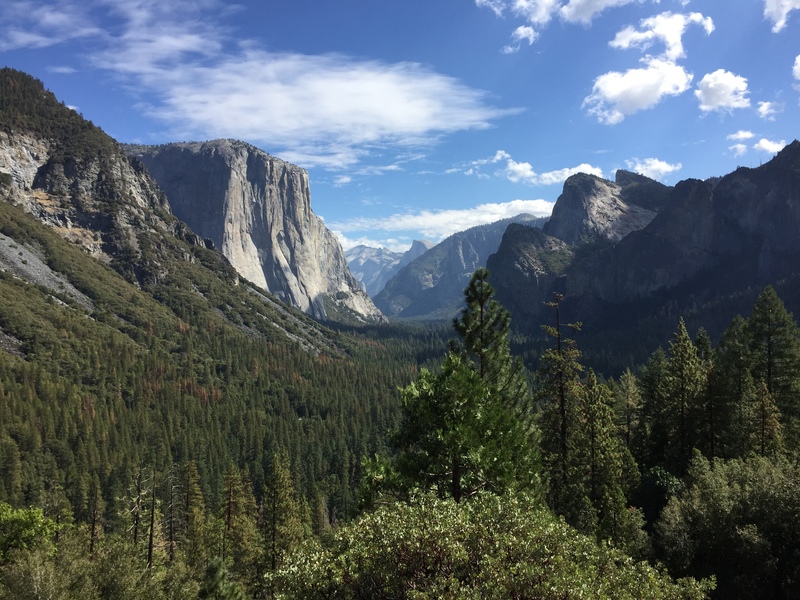 Some of the very best views in the park are on display at stops at Tunnel View, Washburn Point, and Glacier Point (elevation 7,200 feet). • Expect to be swamped with other tourists, and MANY other cars. I arrived at Glacier Point at about noon, after departing from Yosemite Village that morning. I’m not sure if it was the exact wrong time to get there, or if it’s always packed, but Glacier Point turned out to be a nightmare for parking. I was stuck in a slow-moving circle of cars, all waiting for someone to vacate a parking place. It was the luck of the draw, and I didn’t get a space, so I exited and backtracked a bit and parked along the road. 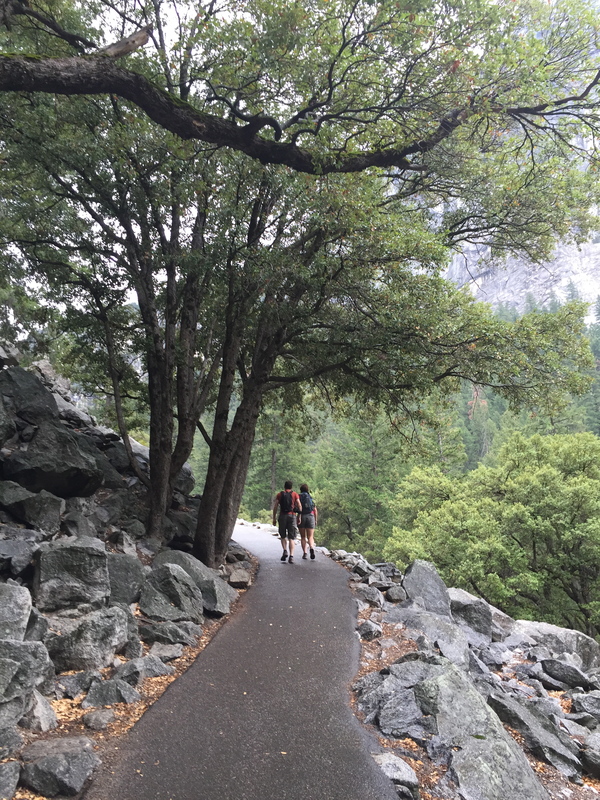 It made for a steep and slightly hazardous walk along the road back to Glacier Point, but it worked. I would suggest taking the first parking place you see as you approach Glacier Point, and just hoof it from there. And along the way, don’t expect to have a lot of solitude. The major viewpoints are likely to be clogged with people, all taking in those gorgeous views. Drive your car unless you absolutely have to. After arriving at Curry Village my first night, I didn’t drive in Yosemite Village at all, until I was leaving to head south two days later. 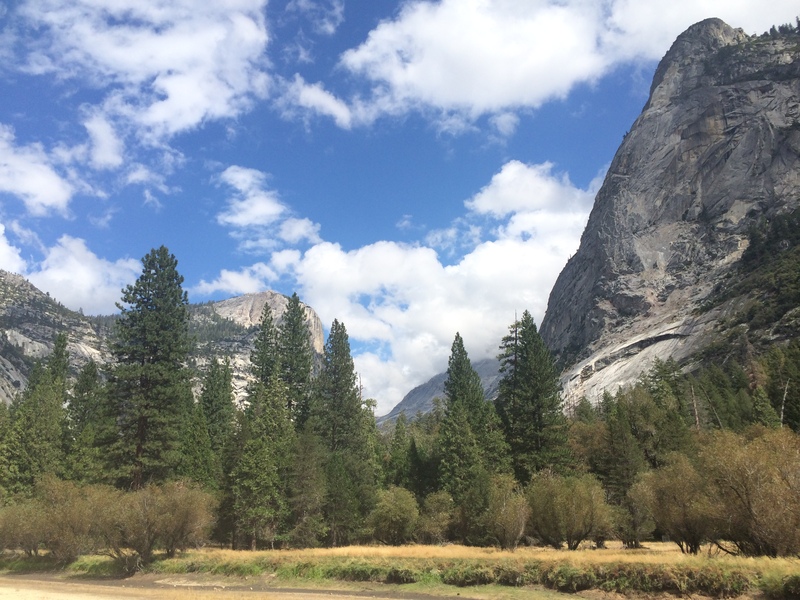 Yosemite has a great shuttle system, and I found it easy to navigate to the various stops. 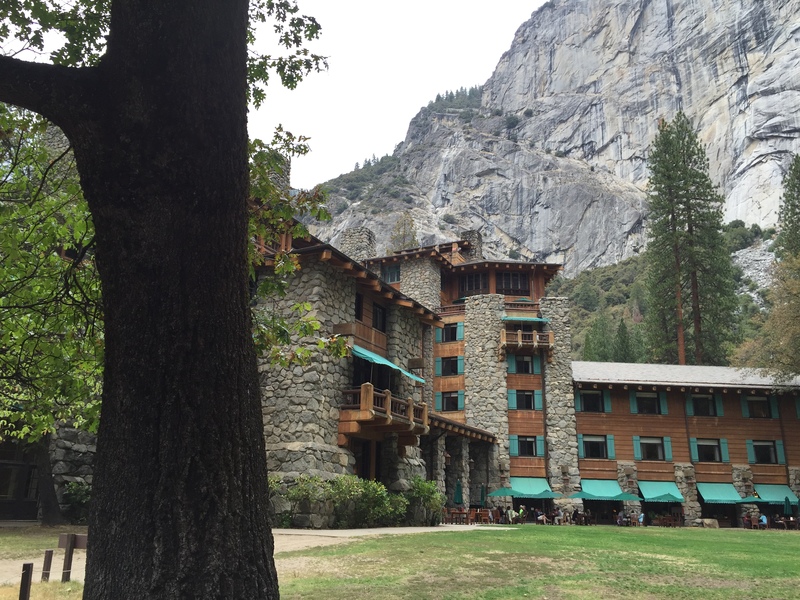 I also chose to walk on the multi-use trail from Mirror Lake to the Ahwahnee Hotel for lunch, and it was a pleasant way to take in the forest, wildlife, and rivers of Yosemite. If I were to make a return trip to Yosemite, I would have a few different priorities: I would spend a night in Tuolumne Meadow; I would plan to do at least one of the really big hikes – perhaps Yosemite Village to Glacier Point (9.6 miles round-trip, 3,200 feet elevation gain) or the Nevada Falls hike, via the John Muir Trail; and I would budget to stay a night or two at either the Ahwahnee or Wawona Hotel. They’re both pricey, but their historic luxury would be a nice treat after the strenuous hiking!